There is a day each month set aside for a special culinary experience. The Sunday Supper Series at Italian restaurant La Pentola takes place the last Sunday of the month, a familia style meal with a new menu each time. Our visit was in February when the menu featured Pasta and Vino. The six course meal was available with or without wine pairings. The evening was like a virtual tour of Italy as each course was from a different region of the country. I was a tourist in Italy a few months ago and had many excellent meals there. I am determined to return some day but until that happens meals in Italian restaurants will have to satisfy my yearnings. We arrived promptly at 6pm. A large curved bar is the focal point of the warmly lit main room. We were shown to a side room with seating for twenty two people at three tables. Two windows facing Davie Street let in the dwindling daylight. A large window to another side room in the restaurant was curtained off, creating a comfortable feeling of privacy and separation from the larger restaurant. As we settled in we were brought fresh bread with olive oil and balsamic vinegar to tide us over until the first course. You might say that traditionally Italians don’t eat bread before a meal but as North Americans we are able to enjoy this without any qualms and it is so, so good. The first course, from the Piedmont region, was Pea and Ricotta Agnolotti with Side Stripe Shrimp, Lemon Butter Sauce and Bottarga. Piedmont is a mountainous area in the north of Italy with Turin the largest city of interest. The fresh shrimp was excellent, the agnolotti equally good. The lemon butter sauce light, harmonious. A Marchesi di Gresy Sauvignon Blanc was the wine paired to this dish, a fine match. The Piedmont region scores high marks all around for this course. From the Adriatic coast to Sicily in the Mediterranean for the third dish of the evening: Spaghetti, Sardines, Currents, Pine Nuts, and Saffron. This dish had layers of texture and tastes. I liked the currents quite a bit. As sardines are slightly oily a full bodied wine was called for. The lovely Mazzei Zisola Nero d’Avola fit the bill fabulously. This rich dark red wine was my favourite of the evening. As good as the spaghetti dish was this wine pairing made it better. The fourth dish to be brought to the table, inspired by the city of Florence, was Pappardelle, Wild Boar Prosciutto and Rabbit Ragu. A translation of the word pappardelle is “to gobble up” and that is exactly what I did with this delicious offering. The boar prosciutto and rabbit ragu were amazing. Jenn said “I don’t know where the rabbit ends and the boar begins. So delicious together!” The wide pappardelle noodle was a perfect choice with this ragu, bringing so much flavour to the mouth with each bite. If I had the talent to make this dish at home it would appear regularly on my dining table. La Pentola makes their pasta in house so you can count on it to be fresh and excellent. A dish this good needs an equally good wine. The Tenuta Guado al Tasso il Bruciato, a blended red wine, did not disappoint. It is a rich, full flavoured vibrant wine that paired very nicely with the dish from Florence. The Veneto region is towards the north of Italy, on the Adriatic sea. Venice and Verona are two of the tourist friendly cities of Veneto. This region is represented on the menu by Potato Gnocchi, Braised Oxtail Ragu, Pecorino. The oxtail ragu was the star of this dish. Lots of flavour, accented nicely by the Pecorino. The wine pairing was Werner Walch Saint Magdalener Schiava, a nice red similar to a Pinot Noir with hints of cherry. I’d not tasted Pecorino before this evening and I am happy to say I very much like this cheese made from ewe’s milk. Dolce is the logical conclusion to a great Italian meal. Four different sweets appeared before me along with a sweet dessert wine. I tried the Lemon Curd Stuffed Meringue first and loved it. The Apricot Biscotti was warm and yummy. A pleasing Raspberry and Rose Water Macaron was next, and my final taste experience was a Sour Cherry Gorgonzola Cheesecake. I was initially surprised at the bold gorgonzola taste but quickly grew to like it. I regret not noting the name of the dessert wine. I can say it was a very suitable choice, as were all the wine pairings this evening. The six courses of this Sunday Supper Series were served over a comfortable three hours. Our servers were well informed about the food and wine choices and were happy to share that information. The theme of the supper series is different each month. Prepare yourself for a variety of interesting courses that will leave you satisfied and full, with or without wine pairings. La Pentola sources vegetables and meats locally and imports olive oils and prosciutto from Italy. La Pentola is located in the Opus Hotel, 350 Davie Street near Hamilton. The restaurant is open daily for breakfast, lunch and dinner. Don’t drink and drive, plan ahead. Bus, taxi and skytrain are all nearby. The Trump Champagne Lounge is a vivacious space! In only our first 5 minutes people watching proved to be very interesting: posh hotel guests walking through the lobby en route to their luxury digs, friends meeting for drinks, an engagement party and satisfied diners exiting Mott 32 with food coma grins. Giggling and judging people quietly to each other Jenn and I ordered the Sparkling Afternoon Tea and the Infinite Afternoon Tea. I'd humbly recommend only one tea set per pair, but gluttony is in, in 2017! The Sparkling comes with a glass of Bartolomiol 'Miol' Prosecco Extra Dry and the Infinite with a very sophisticated Laurent-Perrier Brut. The Prosecco had a nice hint of blackberry and was full of flavour and the Brut was very tart, which I like, and had a fruit aromas with a slight citrus finish; delicious! We also ordered the Bain de Roses and Royal Darjeeling from the venerable TWG Tea. Our tea set arrived, amalgamated, and sitting on a very unique hexagonal pedestal which really showed off its wares! Scones, as fresh as I've ever tasted, with a very frothy Devonshire cream and house made raspberry jam and lemon curd; lovely! We plunged into the tower with the Salmon à la Bombay Petite Sliders. Think smoked salmon with a mild curry kick, very good! The Rolled Egg Sandwich followed and the Italian Truffle tapenade really shines through just as the cream cheese stole the show in the Cucumber & Dill sandwich that followed. My first experience with my favourite condiment in the world, Sriracha, in a high tea set and it was a good one! Duck, delicious, mixed with oyster sauce, awesome, the aforementioned Sriracha, and wrapped in a fluffy crèpe! A very, very nice finger sandwich! I could have eaten 50. Some people claim that breakfast is the most important meal of the day. Well I'm going to make an official argument for dessert finally getting the nod. Stay with me. Cake contains eggs, eggs contain protein and protein helps to rebuild and grow muscle. Sugar affects the same pleasure centre in the brain as cocaine. Would you rather kids did cocaine than eat cake?? Would you?? Cheese cake pops, hazelnut chocolate cake, Matcha and strawberry rolled cake, white chocolate and raspberry mouse and raspberry rose water lychee Paris Brest. Cake, cake, cake, mousse and whatever the last one is, not a bad way to end a delicious meal! You could go just for dessert and leave very satisfied! Having had no fewer than 30 different afternoon teas in the last year I can pledge that Trump does it as well as anyone around! Their service is amazing, always, and the ambience is beautiful. You will not be sorry you went in even if you are sorry about its unfortunate name. They're making us forge by offering world class hotel accommodations, luxury condos, sublime spa services, a raucous nightclub and incredible dining in Mott 32 as well as the Champagne Lounge where we found ourselves enjoying our tea experience. I would highly recommend you checking out Trump! The Marinaside area of Vancouver is one of the most breathtaking communities in the city! The yachts, the seawall, the posh restaurants and the ultra luxury condos and townhouses. Poshest amongst the eateries is the decadent Provence Marinaside. Our experience starts, at Wine Director Josh's recommendation, with a nice, light 2016 La Beyssannette Rosé from, perhaps not coincidentally, the Provence region of France. A very pale pink with notes of strawberry and citrus that compliments, but doesn't overpower the vintage. Delicious! Out pops an amuse bouche from Chef Jean-Francis Quagua halfway through our first sips, perfect timing. The baby shrimp salsa pops with a fresh vegetable burst and the shrimp is perfectly cooked and as fresh as if they pulled it from the Pacific Ocean which lies a mere 50 feet from where we sit. Lobster bisque is good. It's universally accepted. Paired with the 2014 Pinot Gris from the Okanagan's Kettle Valley winery it elevates it even further. The richness of the soup is neutralized perfectly by the acidity in the wine. A bite of lobster with a heavy spoonful of broth and chase it down with a sip of wine. You'll thank me! Emmenthal cheese has just recently come onto my radar, even a foodie misses some things, and it is good. Try melting it with Dijon, shallots and mushrooms then adding Atlantic lobster. It is a revelation. Again the sommelier reached into the Okanagan Valley for his pairing; the 2008 Summerhill Cipes Blanc de Noirs. If I had Josh in my employ I would have him pair my morning Cheerios, wine is life! There's a reason that lobster is expensive. It's a similar reason that Maseratis are expensive. Demand. The flavour of a good lobster, drenched in molten butter, cannot be easily described. The performance and hand made detailing in a Maserati is likewise difficult to articulate and, as such, the demand is high so the price follows in lockstep. We ordered the Whole Lobster Gratin and Whole Atlantic Lobster and did not, for one second, regret our choices. The gratin offering is paired with the delicious Angels & Cowboys Rosé from Sonoma County and the latter with the eclectic 2014 Reichsrat von Buhl Spatburgunder Rosé Trocken from Germany. When a sommelier drops off a glass of wine and can't explain its bouquet or highlights, especially one as talented as Josh, it will make you curious. The German wine is quite nice, but certainly difficult to put a finger on. It did; however, pair extraordinarily with the lobster and helped propel it into a fine dining category that few eateries in Vancouver match. The Sonoma wine melded with the smoked tomato infused gratin lobster and it was probably my favourite of the two, but, like a doting parent, I hate to play favourites. Something about rhubarb takes me back to childhood. I remember picking it in our yard as a very small child and washing it like mom had showed me and sprinkling a bit of sugar on it and going to town. Mama's little baby also loved shortcake, shortcake. Provence's strawberry and rhubarb shortcake elicited a gasp as it arrived at our table. The perfect combination of sweet and tart and the shortbread was so fresh and flaky! Paired with my first experience with a late harvest merlot, the Paradise Ranch Merlot Ice Wine from the venerable Okanagan Valley. Delicious! Even if you have just came from dinner you can still spoil yourself with an amazing dessert at Provence! Service is a near perfect 9/10, only to give them something to strive for, and ambience is a perfect 10. Full stop. Treat yourself to one of the best restaurant in vancouver! As you walk into Mott 32 the first thing you will notice is... well there's a lot. Like a lot, a lot. But one thing that will certainly strike you is that each table has unique, custom-made seating and each area has a subtly different theme. The outlying tables, some close to their lovely new patio and some near to the lavish, intimate bar, each have a particular, distinctive style. 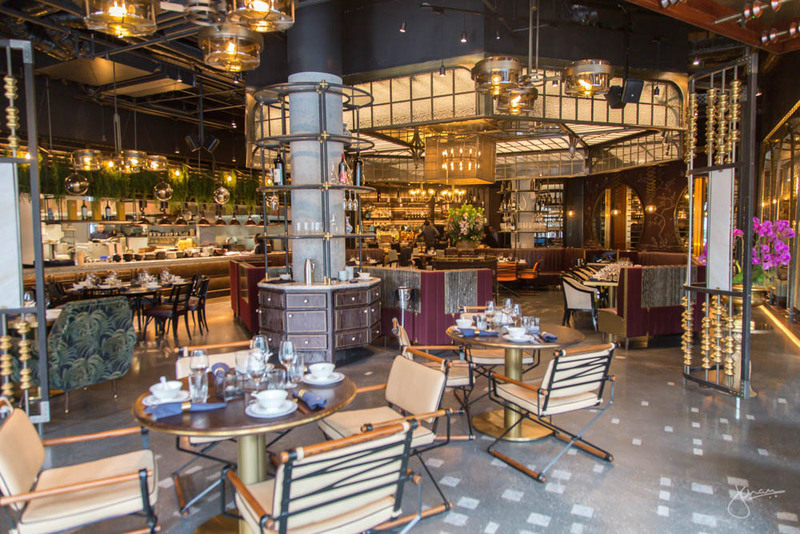 As you get to the centre of the restaurant you see the space is dominated by Mott 32's signature steel octagon. During the day natural light streams through the octagon ceiling's frosted glass panelling, but at night the soft lighting and dark walls beckon with a sultry, sophisticated ambience. Our culinary adventure started with an amuse bouche; fried tofu with candied ginger in a sweet and sour sauce. My usual gripe with tofu is the slimy squishiness, but Mott fries these until they're crisp. The sauce complimented them perfectly and signalled we were in for a real treat during our first visit! They were followed closely by our chosen appetizers: the Maine Lobster Har Gow and Shredded Peking Duck Spring Roll. The har gow was packed with lobster flavour and dripping with saucy goodness. A solid 8/10 on the deliciousness metre! The spring rolls are a revelation! We watched as whole duck, which must be ordered 24 hours in advance, after whole duck rolled by our table to be cut up table side for our lucky fellow diners. Our spring rolls helped to dry our tears from not having ordered the delicious, succulent duck and the crispness of the roll made the flavour of the duck pop. No soggy, previously frozen spring rolls at Mott! I hate to give perfect 10/10's because chefs need a goal in the distance to strive for so I'll label these a 9.7/10... They're amazing! Top five spring rolls of my life! Starting to feel the groove we welcomed our entrées: Alaskan King Crab Vermicelli, Australian Wagyu M9 Sirloin and 24 Hour Slow Cooked New Zealand Lamb Shank. The vermicelli boasted more roe in a pasta dish than I have ever seen. Large pieces of crab, fresh, thin noodles and every bite covered in flying fish roe! The roe provides a nice crunch to the dish which compliments the tender pasta and supple crab perfectly; delicious! Wagyu beef, as I have often ranted, makes other beef, AAA, sirloin, New York, whatever, taste like Big Mac mystery meat. The innovative 'log house-style' plating, homemade black bean paste and tasty button mushrooms almost made me forget that the bottom layer of the log house was one of my arch nemeses; the leek. Out of deference for the talented Mott 32 chefs I ventured a bite of onion's ugly cousin, but, sadly, as predicted, I didn't enjoy it. Jenn loved it so I am willing to go with her assessment: "fresh, perfectly cooked and tangy." Now onto the winner of tonight's "what did you enjoy the most" prize; the lamb shank! Jenn and I have recently started slow cooking. Everything! Put a rack of ribs in the slow cooker and add... things... I'm not actually sure what she's putting in there, but I do know you can cut the meat with a cross look or a stern glance. You could eat Mott's lamb shank if you didn't have any teeth, it would be easily gummed down! The 'northern spices', about which I could not get many hints for our very talented server, is very tasty. The hulking, very photogenic, lamb shank is worth a trip to Mott all in its own and I implore you to try it! Almost ready to roll home like the obnoxious, blueberry girl who couldn't leave Willy Wonka's gum alone in Charlie and the Chocolate Factory, we opted against dessert. Seeing as how we live less than 200 steps away, we counted, we assured ourselves we would be back to partake and we never let ourselves down when gluttony is involved! Got to Mott 32, treat yourself, you'll be glad you did. Mention us at Jenn Chan Media and I'd wager dollars to donuts there will be a surprise in store you you! Gazing up at the $275 million Holborn Group built, Trump branded, twisted tower of glass and steel it is difficult to fathom the sheer scale of such a large project. Where do you even start to build such a behemoth? Who do you hire? How long will it adorn the majestic Vancouver skyline? Where did all that money go? When you walk in it is immediately apparent where the money has gone; details. Marble, crystal and dark woods everywhere. Custom made furniture, floor to ceiling windows and 180 eclectic pieces of art by local Vancouver artist Miriam Aroeste commissioned specifically for the tower. This is luxury. Our staycation experience starts long before we enter the doors to our sensational hotel room. It starts with service. Bobby Bissessar is a prime example of someone you want to be customer facing if you run a luxury hotel, a Fortune 500 company or even a hotdog stand. The term people person gets thrown around a lot in this day and age. It equates to someone who genuinely likes people; who is humble, affable and accommodating and Bobby is all these things and more! As the Marketing and Leisure Sales Manager he is our point of contact and we are grateful for his professionalism and friendship. Open the door to any hotel room in the tower and you will be awed by its modern features and beautiful design, but open the door to an Executive King Suite and prepare to pick your jaw up off the floor! An immense tv sits at the foot of a heavenly soft yet supportive king sized bed with an enormous, white leather headboard. Sizing things up I estimated the headboard alone to be worth upwards of $10,000; details. A well appointed desk sits adjacent and Jenn spends a lot of time there editing these beautiful photos you see above. Just beyond that is the bathroom that wouldn't look out of place in a high end spa. A stately, standalone tub dominates one corner and, to the right, double sinks precede an all glass shower with a luxurious rain head. With a push of a button all the blinds close for privacy. The balcony, one of the iconic oval outcroppings on the tower, is spacious and has a very comfortable patio couch which offers a nice peekaboo view of the Vancouver Yacht Club and beautiful, supernatural Stanley Park. Staying at Trump will make you feel pampered and ready to explore the splendour that is Vancouver!